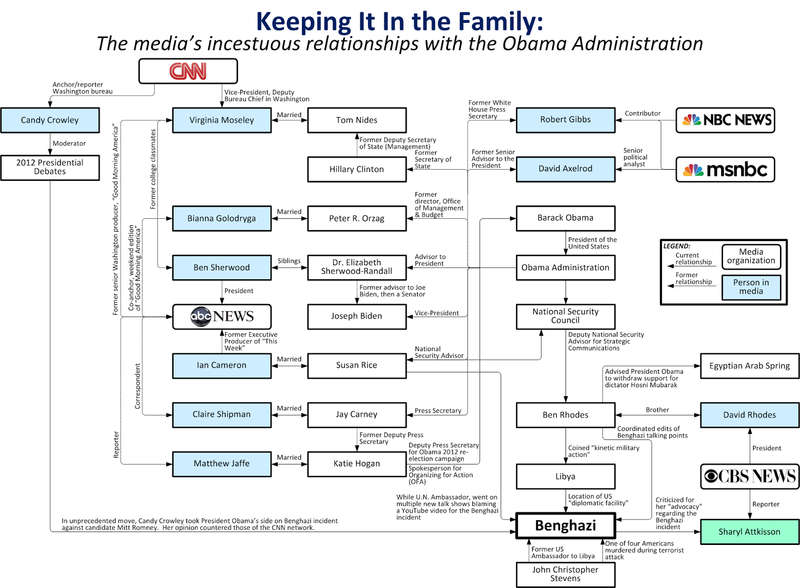 There is an incredibly incestuous relationship between the media and the administration. Because of this, and because of the media’s puppy love crush on Obama and desire to see him re-elected, the seven-hour-long slaughter of the ambassador and three defenders at the U.S. diplomatic mission in Benghazi and the administration’s role in facilitating it and covering up their fecklessness never received the attention it deserved. Secretary of State Clinton’s refusal to provide the necessary security teams the ambassador repeatedly begged for, the murky arms dealings going on there, fallout from the unnecessary removal of the then-compliant Libyan head Kaddafi, and the refusal to send in troops to aid the beleaguered U.S. forces were all brushed aside by means of a dog-and-pony show about a barely viewed cockamamie video whose producer was quickly bundled off to jail before the paparazzi. Hillary, the president and even Colin Powell made appearances as the coffins of the 4 Americans slaughtered there arrived home and disingenuous expressions of sympathy and concern were uttered. All of this was a cheap show for the dummies. No one with any sense at all believed the official explanation even after Susan Rice -- who had no operational part of the events nor firsthand knowledge of them -- was trotted out with the fantastical story. Efforts to get to the bottom of this have been routinely stymied and Congressional committees stonewalled by the malfeasants and their staffs. Judicial Watch, less constrained by law than the committees, finally got the smoking gun emails which establish beyond peradventure of doubt that the administration covered up the truth to boost Obama’s re-election. The Rhodes email and new talking points went to many top Obama administration communications and political officials, including press secretary Jay Carney, communications director Dan Pfeiffer, and Obama’s 2008 campaign manager, David Plouffe. Top diplomats and intelligence officers in Libya offered assessments of the Benghazi attacks that were true when they made them and remain true today. But top Obama administration officials ignored those assessments. Six weeks before the 2012 presidential election, those officials -- at the direction of White House communications and political strategists desperate to maintain the fiction that al Qaeda was “on the run” -- lied to the public about how four Americans were killed in a sophisticated attack carried out, on the anniversary of 9/11, by terrorists affiliated with al Qaeda. In case you missed it, Ben Rhodes' brother, David, is the president of CBS who is reported to have stymied Sharyl Attkisson’s reporting of this and other Obama scandals. To make matters worse for the administration, former NSC spokesman Tommy Vietor, who seems to have been awarded that slot because years before he volunteered to drive a press van for Obama’s senatorial campaign, appeared on Fox News, called Bret Baier “dude”, claimed to not recall his role in crafting the talking points as they were written ”like two years ago”, and conceded that Obama never was in the situation room when the battle in Libya was taking place. In response to these disclosures, House Speaker John Boehner announced the formation of a select committee headed by Trey Gowdy (who does know how to ask questions of witnesses, unlike most of his colleagues) to investigate what happened at Benghazi and the administration’s handling of the incident. This seems to have compelled the Washington Post to cover the story. (Not on page one, however, where more important stuff like how Palestinian terrorists in Israel are smuggling out their sperm to impregnate their wives is covered instead.) Here, the story by Wesley Lowrey is cast as a Boehner concession to the far right and half the wordage is devoted to quotes from Democrats opposed to the expanded investigation for all the usual reasons -- already investigated, old stuff, purely political -- which the Clintons trailblazed. The paper didn’t use the expression “vast right wing conspiracy” though they said as much. Conservative passion around the story is driven as much by the notion of a corrupt Obama White House as it is by a grievance that the news media has largely turned a blind eye. Maybe if we spread the word that one of the Kardashians was dating a guy named Ben Ghazi, low information ears would prick up at the sound of the name. Still, in both newspaper accounts the writers observe that, even with the full-blown lying and covering up and the media aid in concealing this mendacity, more than half of Americans believe the administration was hiding something even though a few percentage more thought the criticism was fueled by politics. And if we are nearing the midterms, you can be sure that the Democrats are stirring the racial grievance pot though the gruel in it is terribly thin these days. My online friend who stole his nic, Danube of Thought, from the deposed Romanian dictator, predicts that “Donald Sterling will file a lawsuit to enjoin the NBA from going forward with a forced sale of the Clippers. He will immediately seek (and get) a Temporary Restraining Order, and shortly thereafter will seek (and get) a Preliminary Injunction prohibiting any action by the NBA to effect a sale, pending a trial of the matter. The trial will not occur for at least two years.” I think he has a point. Unless Silver has more information than we have, the provenance of the tape and its admissibility as evidence seems dubious, and what else is there to deprive Sterling of this valuable property right? In any event, the attack on him seems to have created a considerable amount of collateral damage. The NAACP leader who was about to grant Sterling a lifetime achievement award, had already granted him two previous NAACP awards despite Sterling’s outrageous record of across-the-board discriminatory behavior. The whiff of racial indulgences being sold taints his already seamy record as well as that of a onetime respectable organization, which like so many others is not what it once was. The Bundy and Sterling incidents seem not to be enough to insure the almost monolithic black voting bloc will turn out to carry the flailing Dem candidates across the line to the winners circle at the midterms. So Obama and his cohorts keep working it. This week’s sob story involves the slow death in Oklahoma of a black man (Clayton Lockett) who raped, beat, tortured, twice shot, and buried alive a white woman, something Obama is trying to fan into another of his misguided Gates-Trayvon type fairytales of injustice. According to the same edition of the Washington Post which reports the “vocal segment of the right” story, the president said the case was “extremely troubling”. Later in the first section of the paper we get Colbert King, opining, in effect, that white racists are always with us and are keeping the black man down. “There’s no short supply of ranters, always ready to spew racial venom,” he says, with remarkably little self-awareness.